MAINWARING (Manwaring, Maynwaringe), SIR HENRY, famous Jacobean pirate; b. 1587 near Ightfield, Shropshire; d. 1653. He was the second of four sons and two daughters of Sir George Mainwaring and his wife, of the branch of the Mainwarings of Peover in Cheshire, educated at Brasenose College, Oxford, where he obtained his B.A. degree at the age of 15. As a skilful seaman, he was commissioned in 1610 by the lord high admiral to try to capture the pirate Peter Easton, but failed. He was then given command of a privateer under letters of marque to plunder Spanish shipping in the West Indies, and sailed in the Resistance of 160 tons, well armed and manned. However, he changed his mind on the high seas and turned pirate. Based at Mamora on the Barbary coast, he soon had a large fleet of captured vessels at his command for international pillage and plunder. To recruit men and obtain supplies of fish he made the Atlantic crossing in 1614 and arrived in Newfoundland waters 4 June 1614 with eight war-like ships. He raided the harbours, taking with him, when he left in mid-September, carpenters, ammunition, 10,000 fish from a French vessel at Harbour Grace, and 400 men (at the rate of one out of every six sailors on the fishing vessels). In 1615 he was sued in the High Court of Admiralty for his attack on the Hound of Flushing at Newfoundland (PRO, H.C.A.14/41, 9). Offered a free pardon by King James I if he would give up piracy, he accepted and was pardoned in 1616 under the Great Seal, on the grounds that “he had committed no great Wrong.” In gratitude for his pardon, Mainwaring wrote a discourse entitled “of the beginnings, practices, and suppression of pirates,” which he dedicated to James I. He sailed for Dover and later rescued a Newfoundland trading fleet captured by pirates near Gibraltar. He was knighted in 1618, appointed deputy warden of the Cinque Ports and lieutenant of Dover in 1620, elected M.P. 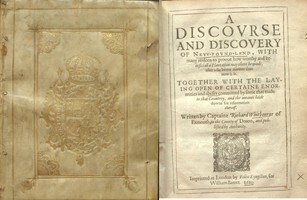 for Dover in 1621, and ended his naval career as a vice-admiral in 1639. Because of his royalist sympathies, he was removed from his position as master of Trinity House, but his Seaman’s dictionary was printed in 1644, despite his political views, by order of Parliament. In 1646 he accompanied Prince Charles into exile in Jersey, where he lived in poverty. He compounded an estate of £8 – consisting of a horse and wearing apparel – with the Commonwealth in 1651. Eighteen months later he died. No tombstone marks his grave in St. Giles’s Church, Camberwell. He was a linguist and scholar of no mean ability, and one of the greatest seamen of the age. His skill in naval attack and his mode of boarding and resisting the enemy were said to be without equal in England. He was one of the greatest of the Jacobean pirates and was regarded as a “patriotic pirate” by those who maintained that he never molested English vessels. There are many references to Mainwaring in the PRO, H.C.A.14/41. The life and works of Sir Henry Mainwaring, ed. G. E. Manwaring (2v., Navy Records Soc LIV (1920), LVI (1922)); I contains a biography of Mainwaring; II, “Of the beginnings, practices and suppression of pirates” (also known as “Discours of pirats,” printed from BN, Royal MS 17 A XLVII) and “The seaman’s dictionary, or an exposition . . . of all parts and things belonging to a ship.” Richard Whitbourne, A discourse and discovery of New-found-land (London, 1620). Philip Gosse, The history of piracy (New York, 1934), 116–28. Prowse, History of Nfld. E. Hunt, “MAINWARING, SIR HENRY,” in Dictionary of Canadian Biography, vol. 1, University of Toronto/Université Laval, 2003–, accessed April 22, 2019, http://www.biographi.ca/en/bio/mainwaring_henry_1E.html.